I read somewhere that The Infinite Moment of Us by Lauren Myracle was being described as the modern day Forever by Judy Blume. Personally, I didn't see that when I was reading the book and the only conclusion that I could make as the story went along was that this was going to be a story of realistic expectations of a teenage love story like Forever was. 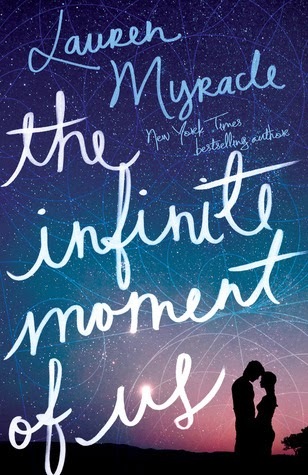 And so for me, the comparison to Forever and the ending of this book is what takes The Infinite Moment of Us as being a 4 star story into 3 star territory. This book could have been a book that I really enjoyed, but without spoiling the story it falls at the last hurdle. The Infinite Moment of Us by Lauren Myracle is very simply, a love story between two individuals spanning the course of one momentous summer. Wren Gray is dealing with her parents expectations and trying to find common ground between what her parents want for her and what would make her happy. And at the same time, Charlie Parker is struggling with the expectations of those around him as well. He's grown up in foster care and has finally found a place where he can belong. My heart went out to Charlie for being in that situation, it can't have been easy. But also Charlie doesn't stand up for himself very much. He's lacking that confidence in himself that would have allowed him to make better choices within this book and in his relationship with Wren. I felt at times that Wren and Charlie's romantic relationship could have been more straightforward than it is. There is a lot of extra drama that is thrown into it, possibly because it was so easy for them to begin their relationship? While I did find the beginnings of their love story to be quite sweet and I really did fall for them as a couple, I also wanted both of them to come to their decisions regarding their lives and their families and this relationship a little bit sooner than they do. More communication from both Wren and Charlie about what they want out of life and with each other. For the most part, I really enjoyed this story. The sticking point for me is that everything is leading to this big dramatic finale. I really wanted this book to end differently. My expectations of a realistic teen relationship does not coincide with the realities of Wren and Charlie's ending, I'm afraid. I'm glad you enjoyed it for the most part Michelle. It seems to be a solid 3 star across the board. I'm intrigued about the ending, I've heard it's a little over the top at times. I do love the cover! Great review! I'm not really into stories that revolve around romance, so I don't think this is for me. Glad you enjoyed it though, and thanks for the review! I completely detested this book, which I hate to say, and couldn't even finish. I'm glad to see that you had a higher opinion on it than I did though, even though you didn't love it. Wow. 'Detested' that's pretty strong!